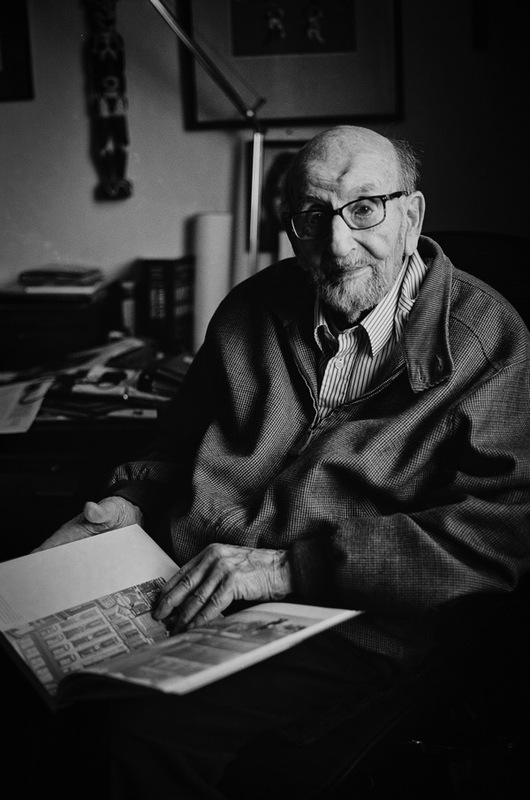 I had the privilege of meeting the late Wolfgang Suschitzky (1912-2016) three times – once at an exhibition opening, once at a book signing and, most recently, when he agreed to a portrait session and interview last year. His apartment was like a treasure-trove with walls covered in photographs, prints and works of art, providing an evocative glimpse into the mind of an artist who, over seven decades, produced some of the most memorable photographs of his generation. 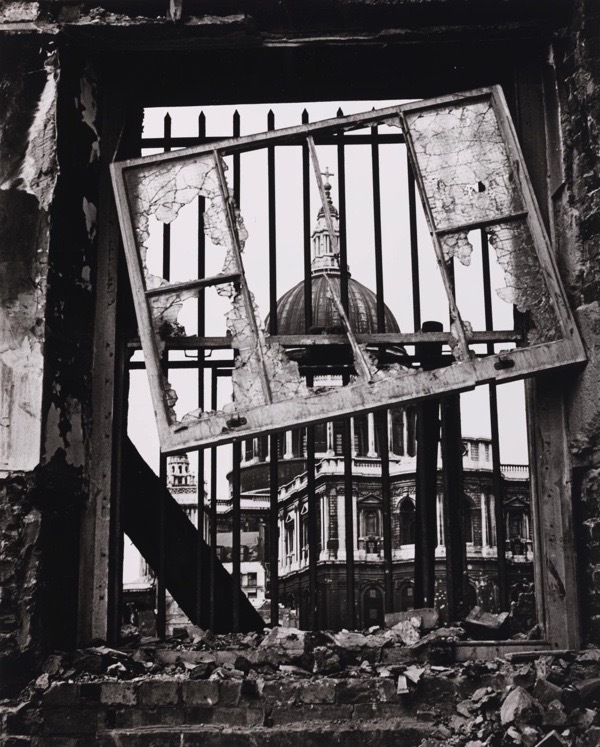 Wolf was kind enough to share some insights into his photographic career and the context of many of his photographs – in particular his famous Charing Cross Series. Born in Austria in 1912, Wolf grew up in the same environment as his his older sister Edith Tudor-Hart. His father, Wilhelm Suschitzky, ran a Socialist bookshop in Vienna and was of Jewish origin, but had renounced his faith and become an atheist. It is clear from his work, and from speaking to him, that Wolf was a humanist who had remarkable empathy with his subjects, both human and animal. His humanity is the golden thread which links all of his photographs together. 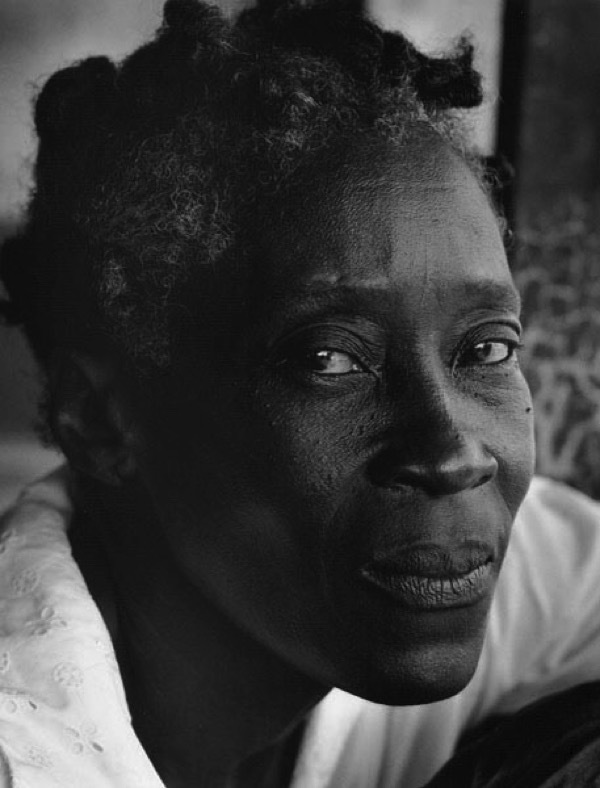 I know of many attempts to categorise Wolf’s photography but the breadth of his work defies any simple description. For me, what is most striking about Wolf as a photographer was his versatility and his ability to apply himself to many different situations. Above all, Wolf was an opportunist with an outstanding eye for what works visually and how to execute it technically. He was in turn a documentary photographer, a portrait photographer, a photographer of animals and an accomplished cinematographer. Whichever mode he was in, his photographs reveal an humane clarity of vision born out of one common characteristic, which was his patience. When I asked him what he thought was the most important element of any photograph, his reply was simple – he said it was timing. Choosing when to press the button and capture a moment was the key to many of his most striking images. Wolf had originally planned to be a Zoologist but his interest in photography was encouraged by his sister, Edith, who had studied at the Bauhaus in Dessau and eventually he enrolled there too. When I asked him about the Bauhaus and what influence it had on his photography he was quite dismissive, saying that all they taught him was how to make a good print. The course was technical and does not seem to have been a great deal of help when it came to the aesthetics of photography and what makes a great photograph. 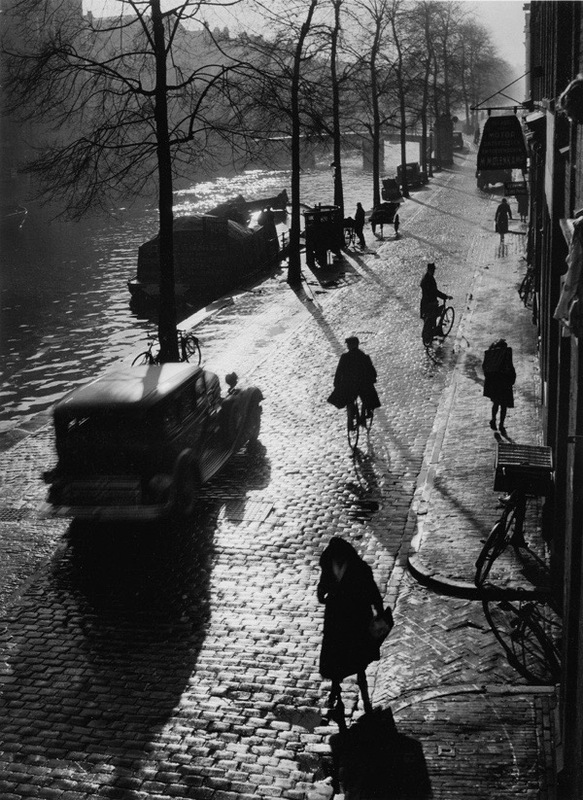 For that, he had to look to other influences such as Henry Cartier-Bresson, Willy Ronis and the emerging Bill Brandt. Yet the technical rigour instilled into him at the Bauhaus laid the foundation on which much of his future success as a photographer was built. You can have the best eye in the world for composition, but it is of little use if you cannot take a good photograph and print it properly. He told me that he always made his own prints and much of his creative interpretation came in the darkroom. He had remarkable skills that are now all but lost in this age of digital photography. Wolf left Austria in 1934 and stayed briefly in London before moving to Amsterdam with his new wife. 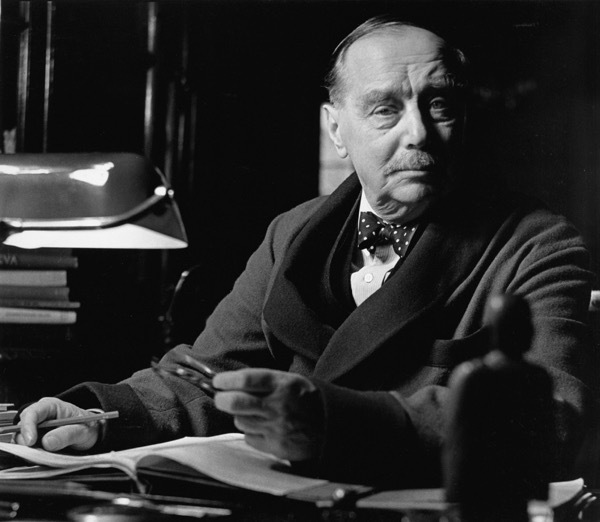 After this short marriage, his wife left him and he returned to London in 1935. He later attributed his existencel to the failure of that marriage, but for their separation he might not have survived the war. His modesty, patience and sensitivity come through in much of his work. They are evidenced by not trying to impose himself on the subjects but allowing them to flow through his lense to the printed image. His archive includes an astonishing range of work from projects he initiated as well as seventy years of commissioned photography. 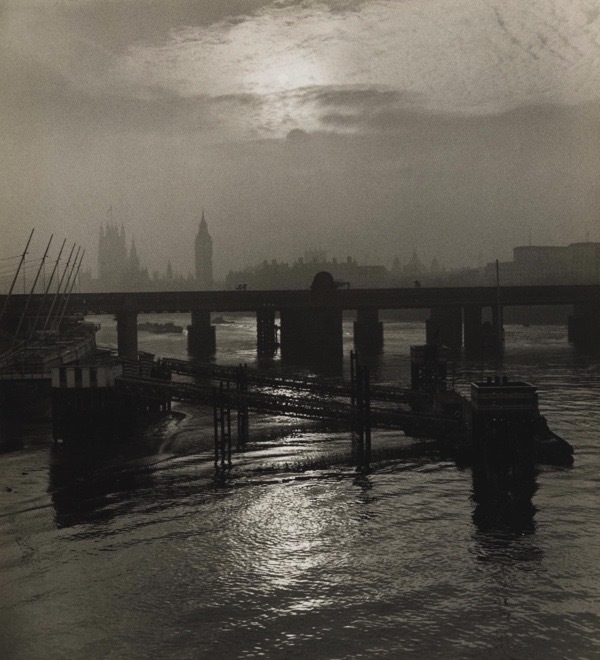 One of Wolf’s most well-known set of photographs is his Charing Cross Series, taken early in his career. As a foreigner in London, he was able to see the city through fresh eyes and took many photographs of everyday life in the capital, which as – a new arrival – seemed far from normal to him. As photographers, we all recognise the sense of excitement in exploring a new city and photographing subjects which the locals perceive to be unremarkable. Wolf’s excitement and interest in his new environment comes through in this series. While many of the photographs possess technical excellence, much of the significance of the series has been acquired in the decades that have passed since the photographs were first taken. He was a struggling photographer at the time, so much of what he took in his early years was opportunistic, aimed at making some money – often with limited success. Originally, Wolf wanted to produce a book of his Charing Cross photographs but the cost was prohibitive and he could not find anyone to publish it. As London was overtaken by war, Wolf’s adopted city was changed forever. 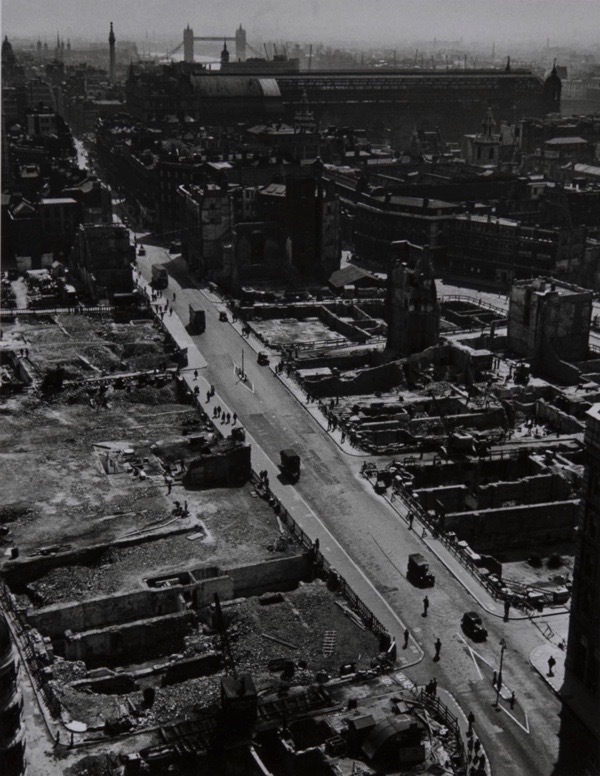 During those dark times, he captured some remarkable images of London at the height of the Blitz. Yet, even when photographing these subjects, Wolf managed to preserve his distinctive style and stand out from those that merely sought to capture scenes for the record. 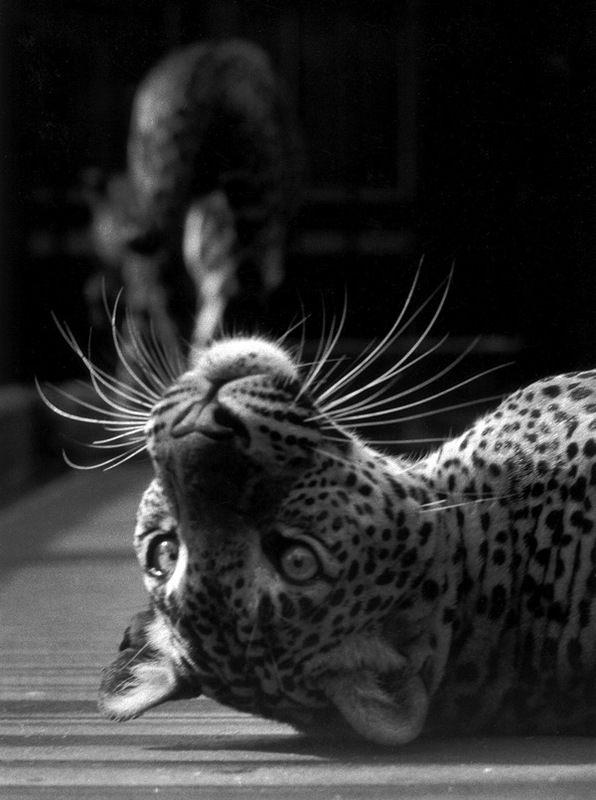 Throughout his life, Wolf maintained his interest in Zoology and took many remarkable photographs at London Zoo, where he enjoyed interacting with animals enormously. Wolf considered these photographs to be portraits in the proper sense of the word and they took a huge amount of patience to execute. Wolf had a particular talent for taking portraits. His modesty, good nature and empathy enabled him to put his subjects at ease. When I asked him why he moved into portraiture, his answer was simple – he did it to bolster his income. Yet his relationship with portraiture was clearly much more than that because it included street portraits for which he earned no fee. Wolf treated both the famous and those who were not famous on an equal footing, always striving to preserve the dignity of his subjects. 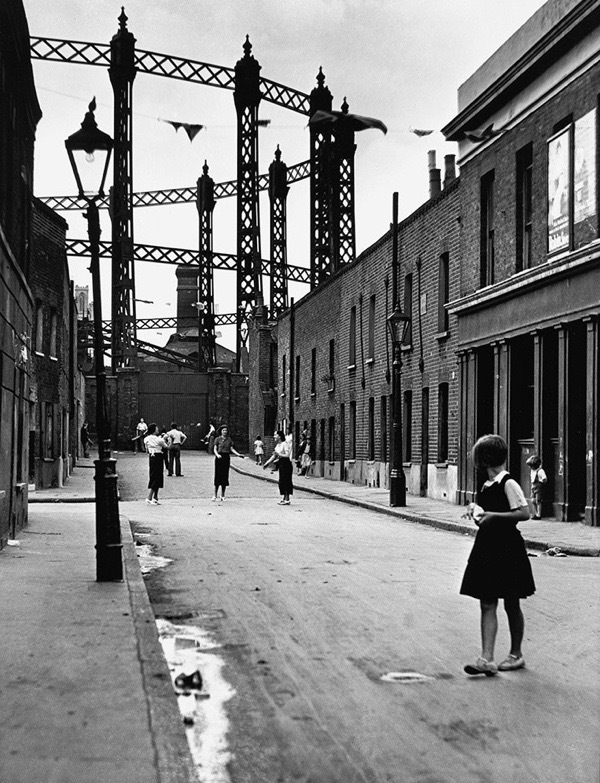 Much like his sister, Wolf was committed to social justice and some of his photographs revealed the poverty of Londoners, especially children. 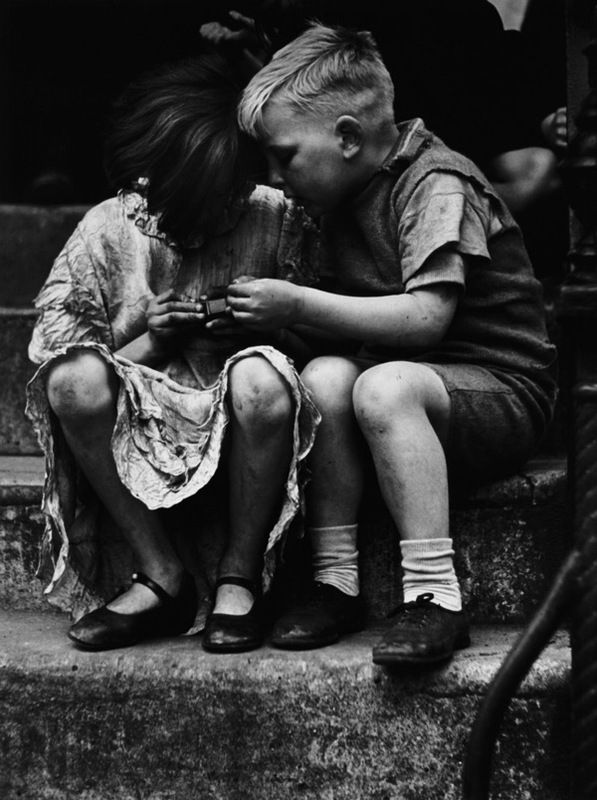 His photograph of two children playing with a matchbox has many similarities to the famous Bakery Window by Edith Tudor-Hart. 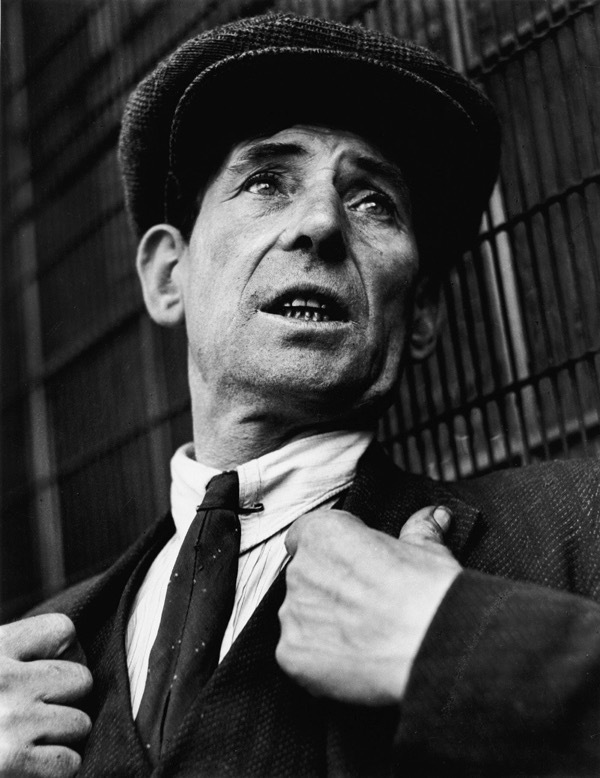 However, Wolf’s photograph was not staged but taken as a candid snapshot of deprivation in the East End. In addition to his ability to portray people and animals, Wolf also possessed an impressive ability to capture the atmosphere of the urban environment, as you can see in the pictures below. Yet I cannot show the entire range of Wolfgang Suschitzky’s work here, I have not even touched on his work as a cinematographer. 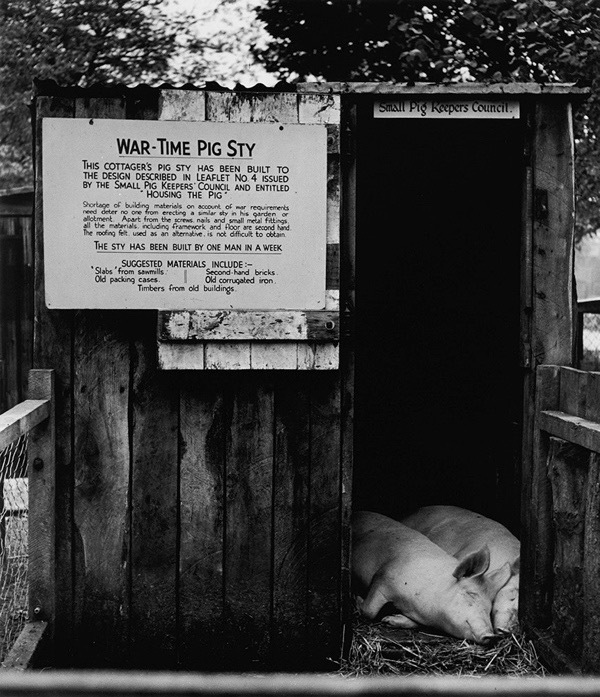 Out of a number of books available, the most recent is Seven Decades of Photography published by Synema, which I highly recommended. The fact that these photographs were all taken using film, with no preview facility and only a limited number of available frames, makes Wolf’s achievement all the more remarkable. 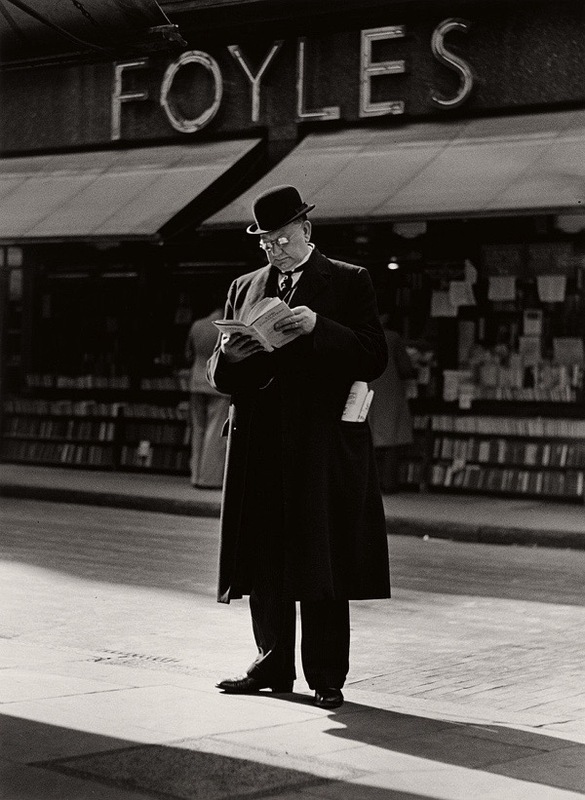 This celebrated photograph of Foyles’ bookshop appears staged but, in fact, is a classic street photograph. Wolf waited patiently across the road for his subject to appear. He told me that he took the photograph speculatively, on the basis that Foyles might be interested in buying it for advertising, but when he presented it to them it was rejected as being of insufficient interest – a decision which seems remarkable in retrospect. Wolf told me that this was a Soho gangster who was not pleased at having his photograph taken, but the woman in the photograph seemed quite flattered and posed for the camera. It is a striking social contrast between the well-dressed gangster and the man shining his shoes. 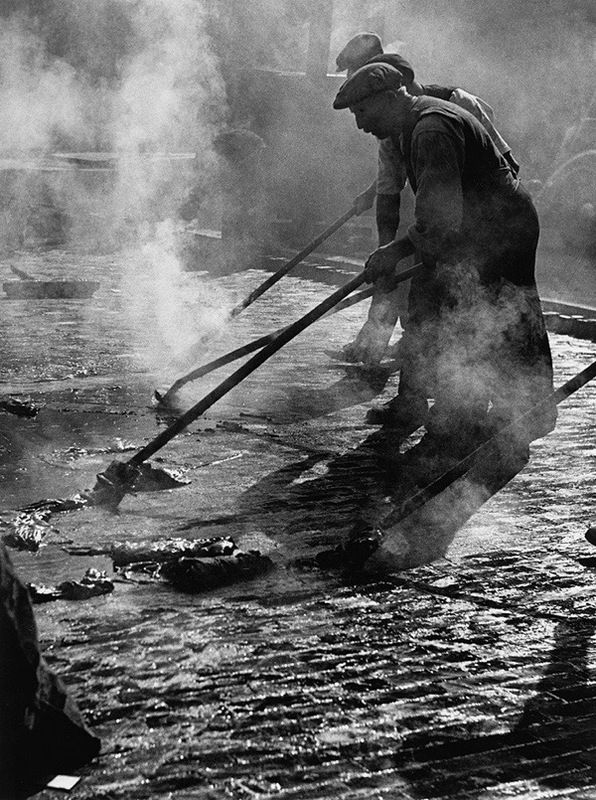 Even as late as 1936, they were using wooden blocks covered with tar to pave roads even though the number of horses in London had reduced drastically. The blocks were to absorb the noise from horses’ hooves and soften the impact for them. 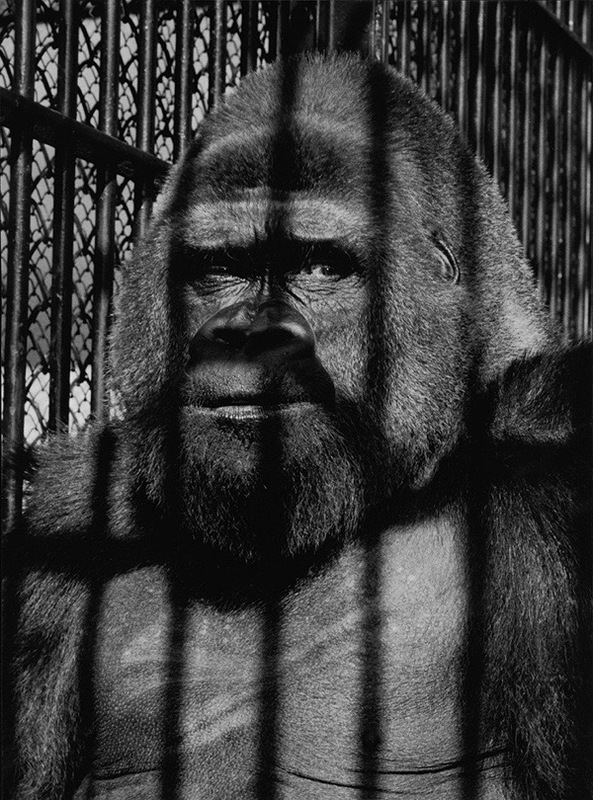 Wolf described this remarkable photograph of Guy the Gorilla to me as being the best picture he ever took. The picture was taken after Wolf persuaded the zoo keeper to allow him to poke his camera through the bars of Guy’s cage, something that would be impossible today. In the resulting image, Guy looks both sentient and resigned to his fate. A magnificent creature imprisoned in a small cage at the will of humankind. The photograph, which was published widely and used by Virginia McKenna in one of her anti-zoo books, epitomises our relationship with animals and how they are often reduced to a mere commodity. This photograph was taken out of the window of a pub where Wolf was staying for the night. It has a remarkable tonal range only possible through his skills in the darkroom, and captures the day after the tram tracks were removed and covered with tarmac. I don’t think my stock of superlatives is up to it. The man caught the soul of a century. 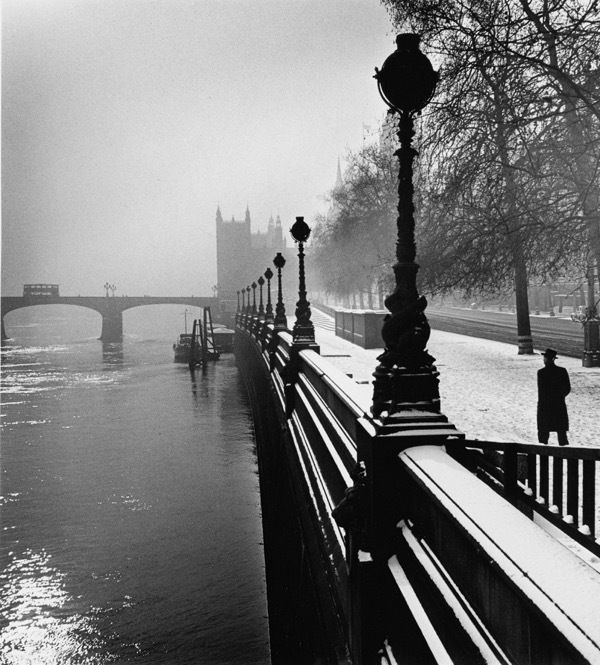 The photos are evocative of a vanished London . 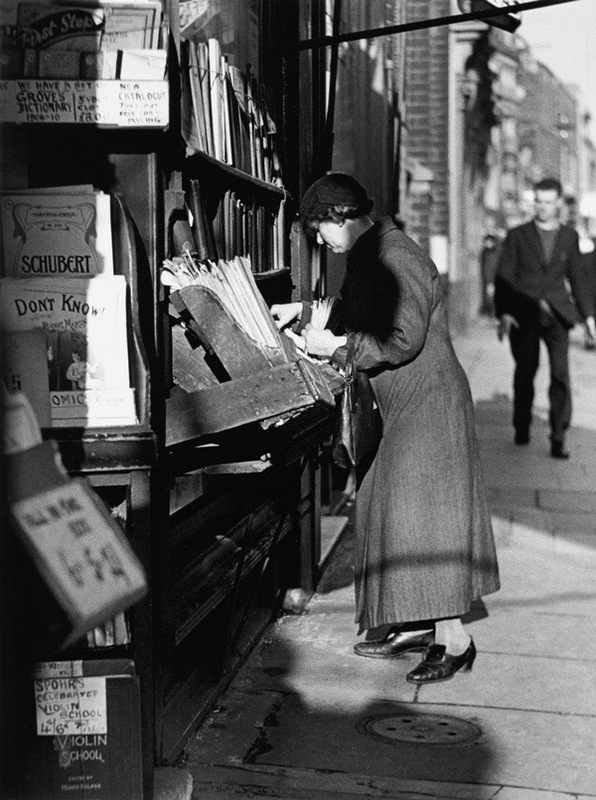 The third photo shows Marks and Co. books, in 1937, the bookshop in “84 Charing Cross Road” by Helene Hanf. 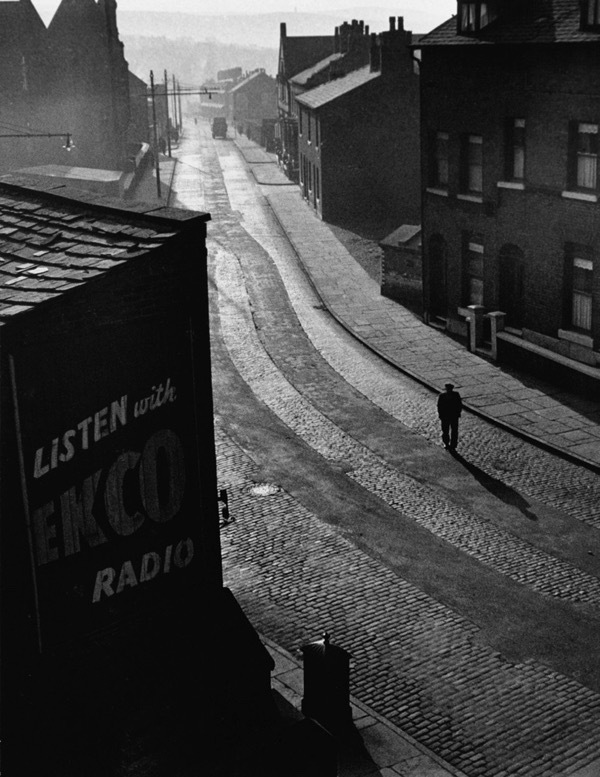 Thanks for posting this…what a brilliant photographer Suschitzky was! I am impressed with the sheer breadth of his output, some wonderfully atmospheric images. A master of monochrome. I need to see if I can find out more…. Thanks so much for this. Wonderful photographs. And memories of Charing Cross Road. Lessons for us aspiring street photographers. Spitalfieldslife is such a wonderful mine of information. I’m with Moyra Peralta, above, on this. 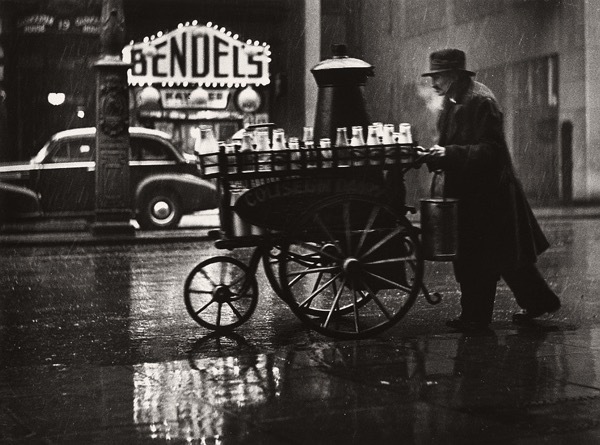 One could run out of superlatives in describing the quality of Suschitzky’s photographs. Effortlessly rigorous compositions that are dripping with atmosphere, beautifully rendered in a range of gorgeous tones. Several of his books are widely available; I can thoroughly recommend ‘Wolf Suschitzky Photos’ published by Synema, Vienna, in 2006, for the broad sweep of his oeuvre. The expression on Guy the Gorilla’s face is so…human. I hesitated to write that noun out of a horror of clichés but nothing else will do. The crouching children and the man outside Foyles also stand out but I am sure the less immediate will reveal their gifts with repeated viewing. 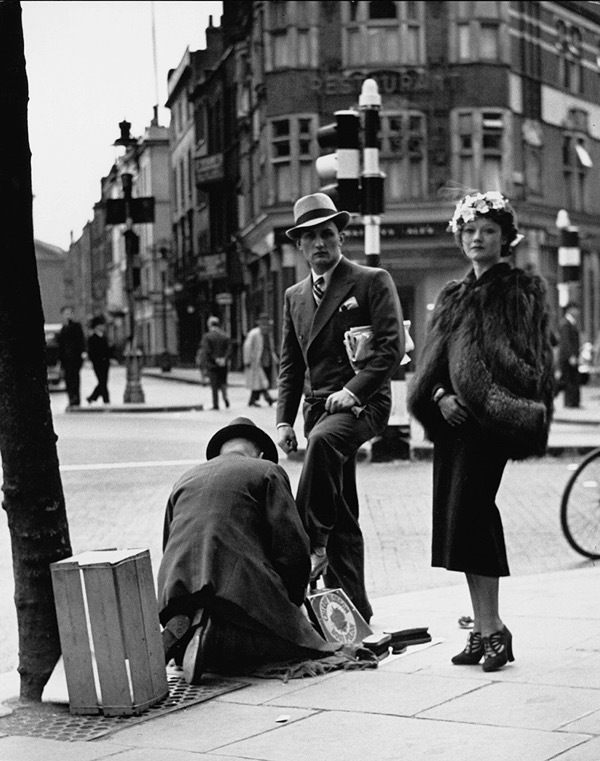 I am already thinking of the sense of entitlement emitted by the young couple in the shoe shine photograph. What a staggering array! What an amazing discovery. I can’t wait to receive the book (easily ordered on Amazon). This blog is a constant flashpoint of inspiration and exultation. Each picture absolutely stunning, visually rich and satisfying and packed with information. Guy the gorilla is especially unforgettable, but I can learn so much from any one of this fantastic selection. I remember the roads of wooden blocks covered with tar. My grandmother used to take me for a walk along there when I had a cough as a kid in the fifties. The work of a true genius. I’m moved beyond words by each and every image. Thank you TGA, I will most definitely be researching the work of this wonderfully talented man. That first picture looks very modern. Great stuff, as ever. I have a small book of Wolf’s photography which I treasure. Thanks for this. I can now go on to explore more of the work of this extraordinary photographer. Wonderful atmosphere of time captured in this photos! What more can one say, these are so good that it almost feels wrong to make any further comment except to say thank you GA for making me aware of this man’s great talent. I remember when I first saw Guy at London Zoo, I was overcome with sadness, he would make eye contact with you, just as he seems to do here, and I can still recall how I longed to be able to do something to help him and to let him know that I wanted to. So so sad and so well captured here. Wonderfully evocative pictures. Some not so long ago. Or maybe I am old. Guy the Gorilla was a favourite of mine as a boy and a very rude gorilla . Which just shows how far we have come in our view of the natural world. Best picture for me the men tarring the wooden blocks . The time machine of photography. 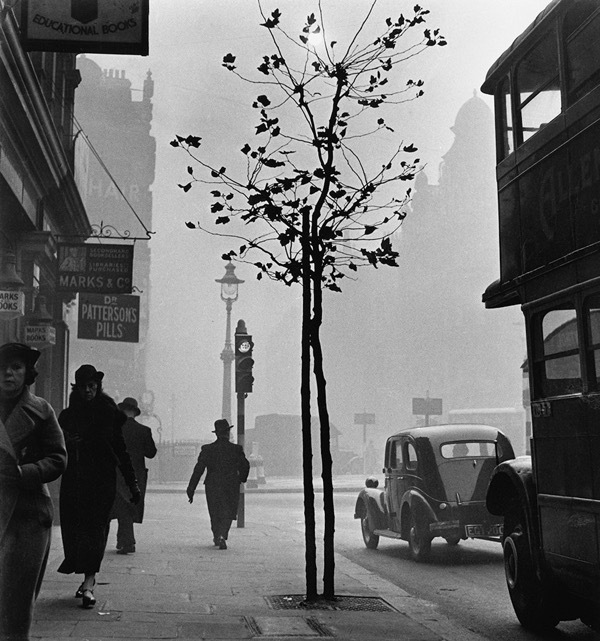 Suschitzky’s work is yet another portal to that other London we all seem to yearn for, that mysterious, misty metropolis full of fine buildings, ragged children and men wearing hats. Being old enough to have vague memories of the fifties I remember some of this disappeared time just after the terrible destruction of the war. Bomb sites were still places we played on, the streets had gas lamps and being taken to Selfridges or Gamages was a magical event. As an East End boy I remember how it looked but I also remember the wonderful people who lived, worked and played together, there was always a friendly face to light up the gloom of the industrial background and the clamour of the docks. In a way, these old photographs, and many others like them, don’t really tell the truth because the people who took them were always outsiders looking for a story and it is their story – rather than the true story – which leads us to believe in a distorted view of the past. Documentary photography is a powerful tool but it is easily manipulated to mislead and portray events in a slightly fraudulent and emotive manner. Black and white photography does this so much better than colour because it make us respond in a different way. Bert Hardy’s work for Picture Post, Bill Brandt, Robert Frank, Cartier-Bresson and many others have photographed London in their own way but when we look at those images we still see the mythical London of our own imagination. Revisiting and read the info below this time to discover the man in the shoe shine photograph was a well known gangster. The fog in the photograph of Charing Cross Rd with Marks and Co is not just atmospheric but, for the modern viewer, evokes the foggy old London pre-late 60s. 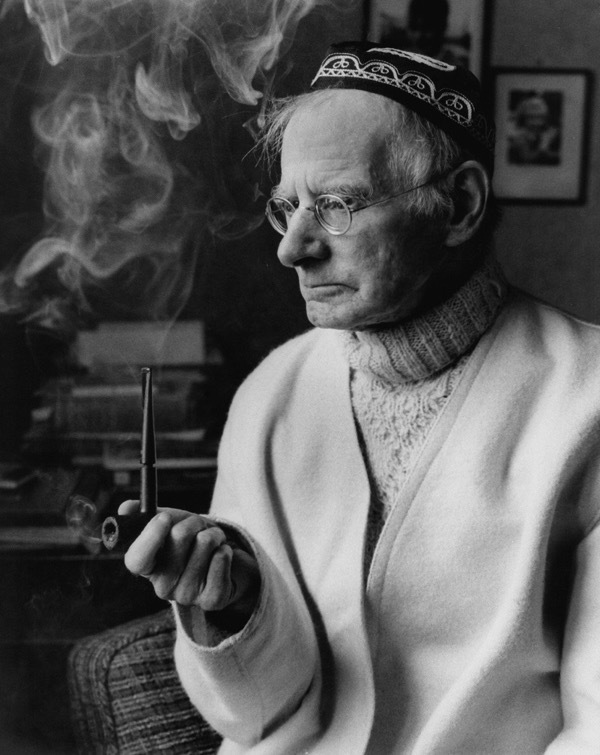 This marvellous man was a part of my childhood as his photographs hugely inspired the work of my father, a keen and talented amateur photographer.Wolf’s younger brother(Sush’)was a bookseller, nice man.The photos in the article are just terrific. Top photo is not Bethnal Green but Dove Row, Haggerston (Hackney) Street name is on the house wall. Bunting is for King George VI Coronation in May 1937. Pub is the Anchor at 17 Dove Row. Gas Works hit by V1 rocket direct hit in March 1945. Houses shown were damaged and cleared around 1949.